Welcome to Winter Preview, a series of posts that highlights sights that can be seen in the winter skies. The constellation Auriga is one of those that looks nothing like what it is named. Auriga is the Charioteer, but you’d have to have a very active imagination to see a chariot in its vaguely pentagon-like shape. The main attraction here is the star Capella; it shines with a golden light and is one of the brightest stars in the entire night sky. 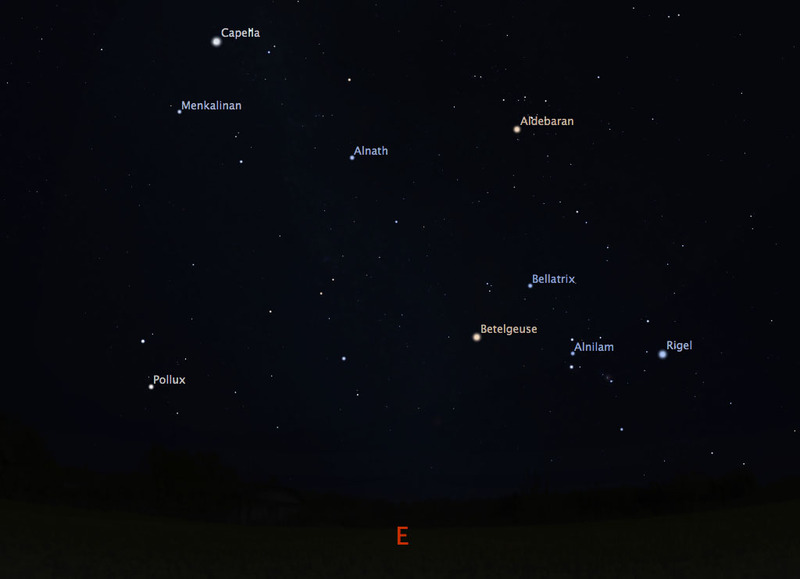 Capella is visible in the eastern sky as soon as it gets dark after sunset. About an hour after sunset, it is already quite high in the sky; in January, it will be nearly directly overhead. Capella is one corner of the pentagon, but it is likely that you will only be able to spot two more corners in the glow of the city lights. The next brightest corner of the pentagon is not even technically part of the constellation Auriga; it is Alnath, the second brightest star in the constellation Taurus. Alnath is below and to the right of Capella, between Capella and the familiar constellation Orion. The other corner visible in the city is Menkalinan, the second brightest star in Auriga. It’s quite close to Capella, just a bit below and to the left. In the diagram below, you can see where these three stars are in relation to the star Aldebaran and the constellation Orion. I suppose that means that for us city-dwellers, the pentagon is a triangle; we only get half a charioteer. Nonetheless, you’ll be able to see it all winter long.